. My memory is indisputably faulty, so I want a detailed written record of my national park adventures.
. It provides a context for sharing my favorite current photos. Not everybody has Facebook.
. My family and friends want to keep track of my adventures, and be able to respond.
. I believe the written word has powerful influence.
. I process information far more completely if I have to tell it in story form, succinctly and colorfully. I come to know myself better as I write.
. I want to inspire others to pursue their lofty dreams by showing them how satisfying it is to pursue mine.
. It’s excellent discipline to practice writing. I get better as I do it. 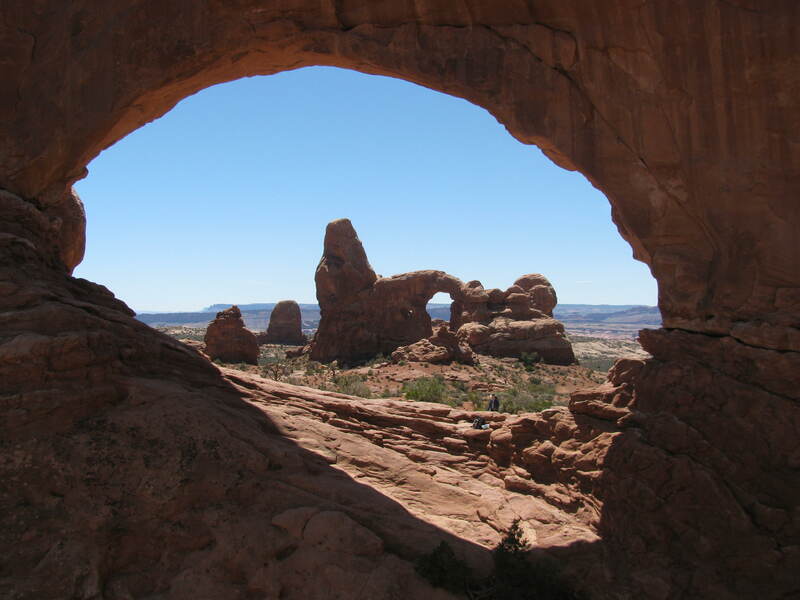 It is gratifying to find just the right turn of phrase to describe my adventures and observations.
. I’m a big fan of the national parks, and want to share my wonder-struck-ness.
. I’ll never write a novel. A few paragraphs at a time is just right. If you blog, journal, keep a diary, or write novels… leave a comment about your motivation for doing so. Turret Arch, photographed through North Window. Better than any cubicle. My phone rang as I was pulling into the Trader Joe’s parking lot; the 435 area code told me that it was rural Utah. I took a deep breath and calmed myself. It had been all of eight hours since I had applied — a contemplative, prayerful eight hours. I unfolded the park map on the seat next to me, slowly perusing its 119 square miles as I spoke with Tricia. “Kathryn, before your season is done, you will have hiked most of what you see on the map, ” she informed me. My heart leaped. 76,000 acres of mostly wilderness would be my office. Its lizards, insects, snakes, jackrabbits, spiders, scorpions, and large mammals would be my sweet companions. The desert plants, in all their spring glory, would be a visual feast when I wasn’t peering through binoculars at the birds I’d be studying. What an utter privilege to have been selected. I floated into Trader Joe’s, humbled, grateful, thinking of Psalm 21: “You have granted her the desire of her heart and have not withheld the request of her lips.” I headed straight for the dark chocolate pomegranate seeds — such a fitting celebratory purchase. It was a two-box day. My ambivalence about pursuing a raptor monitor (i.e., non-ranger) position was being challenged internally and externally. If I had any hope of returning to my beloved red rocks on the Colorado Plateau, I knew I couldn’t depend on securing a ranger job. The “bird in the hand” — an expenses-paid but salary-less internship — was becoming increasingly attractive, as the “two in the bush” could well stay in the bush all season. All I needed was that final nudge. 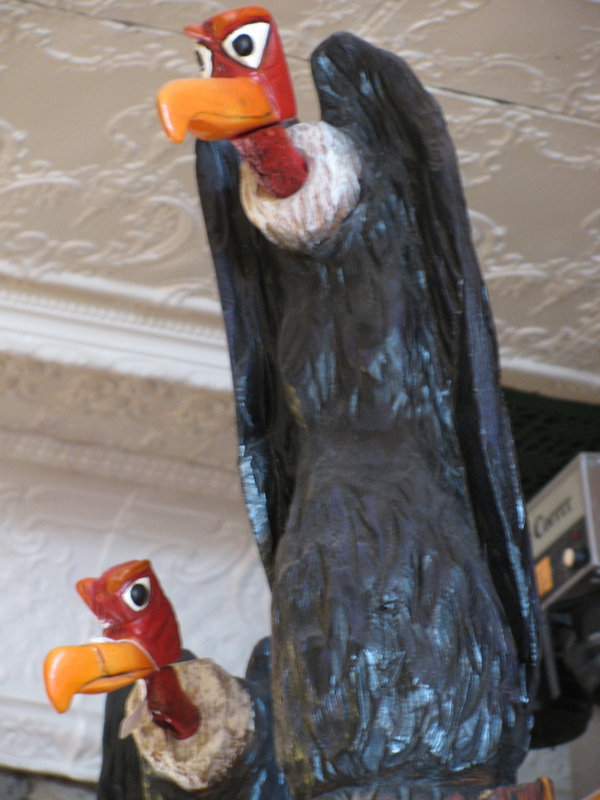 The tipping point came in an email from a Wisconsin birding friend. “Kathryn, just think: the idea that you could consider a position like that is epic in itself.” His words struck me with much force. I was inexplicably holding a rare gift at arm’s length. I contacted the hiring official, who told me that she would be interviewing her top applicant the following day, and that if I wanted to be considered for the position I needed to have everything submitted online within twelve hours. I hoped these would put me a notch above my competition. It was New Year’s Eve. I sat contemplatively, poised to file away the 2010 calendar and open the blank 2011 one. 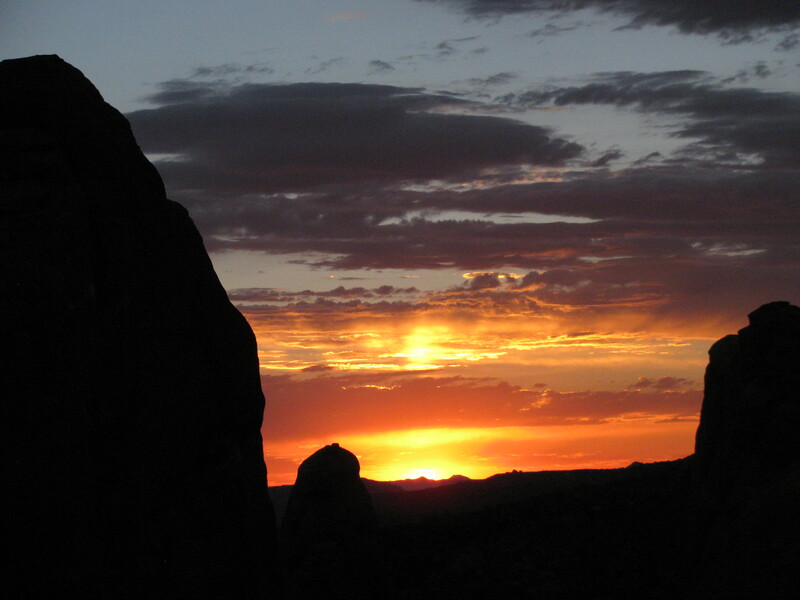 Restlessness filled every cell of my being as I lingered over thoughts of the past year’s exceptional desert adventures as a park ranger in Utah. Nothing but a long string of question marks lay ahead. I was finding many doors closed with the Park Service due to budget cuts and hiring changes. A gnawing fear of finding myself summering in southern Minnesota farm country, instead of in vast and glorious national parks, nibbled at my gut. I would do almost anything to get back out west. A former colleague had recently posted on her Facebook page an internship opening that I couldn’t shake. 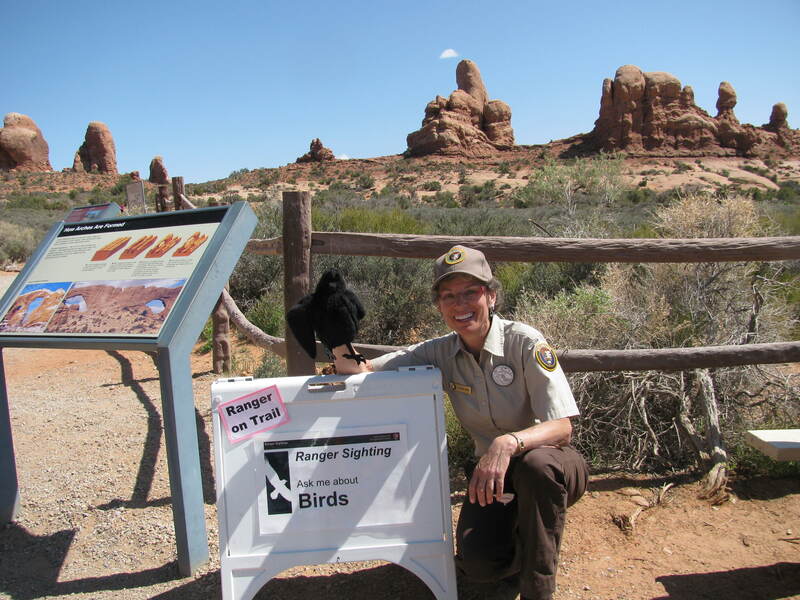 She needed someone to live at Arches National Park during the raptor breeding season and hike daily into the backcountry to monitor nests of hawks, owls, and other birds of prey. A Great Blue Heron rookery on the Colorado River would also be observed regularly for nesting and fledging data, and there would be a Breeding Bird Census for songbirds carried out one morning a week. To this amateur birdwatcher since 1977, it was a delicious-sounding opportunity. Birds, solitude, breathtaking scenery, interesting co-workers, and more than a few three-day weekends in the wilderness were in the attractive mix. Why wasn’t I leaping at the chance?! What could possibly be holding me back?!? I sighed and slumped back in my chair, finally becoming aware of the root of my dilemma. I wouldn’t get to wear my beloved park ranger uniform. The green and gray symbolizes everything wondrous and wonderful in the past two seasons. This job’s uniform would be the brown and khaki of an intern with the Student Conservation Association. Would I be willing to make the swap? Could I dream in a different color?